Come along to the best party in Madrid, a bus with a 4000-watt sound system and the best party atmosphere in the city. Visit Madrid’s best nightlife spots and be treated like a VIP, including a half hour of free sangria. 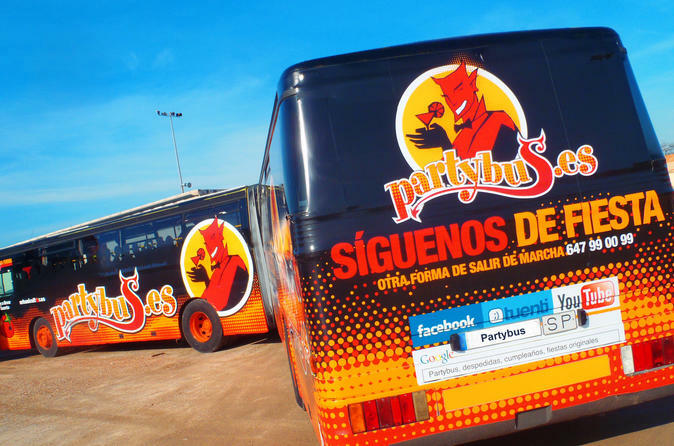 A party bus is an ideal way to get to know Madrid by day or by night. Madrid is a city famous for its tapas bars, lively streets and most importantly, its nightlife. Join this tour and discover Madrid’s lively nightlife while meeting new people on a unique night out. The bus has a 4,000-watt sound system and the best party atmosphere in Madrid. Your tour will take you to some of Madrid’s best nightclubs, where you will be treated like VIP. The party bus includes a free drink in the first club and a half an hour of free sangria at the meeting point to get your night started. You will be taken to three of Madrid’s best nightclubs without any of the hassle. No entrance fees, no waiting in line, and discounts on the price of your drinks. Choose the party bus tour now and enjoy an unforgettable night of clubbing in Madrid.